It may seem that making friends just happens, an effortless side effect of your child playing with others and having fun. However, underneath this apparently simple activity, a host of personal and social skills are being tried and tested. Your child’s ability to share, developed gradually between ages three to five, will stand him in good stead as a friend. Children will prefer to play with him if he can hand over a toy rather than hog it, and if he is willing to follow their play ideas as well as suggest his own. Encourage him to be a good team player by setting up and supervising games or activities involving cooperation and praise him frequently when he gets along well with others. Remember, your child is still working on skills such as cooperating, so things won’t go smoothly all the time. Friendships have to be started somehow, often through a shared and playful activity. When your child has the imagination to start up a game and spark the interest of others, he creates an opportunity to make and strengthen friendships. Simple ideas work best—perhaps he just shouts out to a group of children, “Let’s play pirates,” or presents a challenge like, “Who’s fastest at running around the swings?” Whatever happens, he’s having fun and drawing other children to him. Getting along with other children involves your child tuning in to their needs and feelings as well as recognizing and regulating his own. His ability to understand and react to others’ emotions has grown from his experience of you being responsive to his feelings. When you soothe him you teach him how good this feels, and the value of doing the same for others. At age four you might see him comforting friends by sitting close and patting them, or knowing when to call an adult to help out. As he matures, he’ll use words to calm his friends, try to problem-solve, and may challenge other children if they’ve done or said something hurtful. Help him to tune in to his friends by asking him to imagine how they feel and how he’d feel in the same situation. The more time your child spends with a friend, the stronger that friendship is likely to be, as each gets to know the other more fully. Encourage bonds to grow by providing plenty of out-of-school playtime and activities with others. Get to know the parents of your child’s friends so you’re comfortable for him to visit their houses, and they can let their children come to yours. This way you may find you build your own social networks at the same time as you support his. Your child’s temperament will also influence his friendships. Outgoing, confident children often prefer a larger group of friends, while shy or quiet children tend to be at ease with a small number of playmates with whom they have a closer relationship. There is little value in pushing your child to have more or fewer friends than he wants. 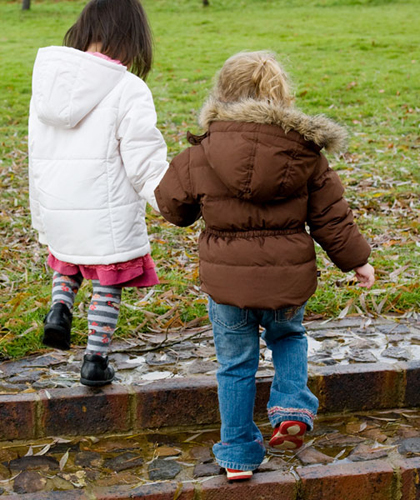 However, do take active steps to help friendships grow if your child wants to, but lacks the confidence to do this alone. It is common for children around six or seven to strengthen their group identity by setting up a group or club, sometimes giving themselves a name or constructing a den. This is a way to build bonds, but may also create problems. Rivalry can develop between groups, or situations occur where children are anxious about being left out or thrown out. Many schools discourage clubs as a consequence. It is up to you to judge whether your child is engaged in a playful and positive group who share values and enjoy the idea of being a club, or if the group identity is having a negative influence. If your child’s school discourages clubs, support their efforts—they’re acting out of concern for the children’s well-being. Create frequent opportunities for your child and his new friend to spend time together. Arrange play dates at each other’s houses, set up a shared carpool, or take them to the park together. Friendship will be strengthened when children have a project or shared goal to achieve. Set tasks or challenges which encourage them to communicate, plan, and work as a team. You could suggest a task such as making a clubhouse in the yard. Your child needs to recognize when to lead a play activity and when to follow the ideas of others. Being controlling is often a confidence issue, so build his self-esteem with praise and games at home to reduce his need to dominate. Good friends notice and show sympathy to others’ feelings and celebrate or comfort as needed. Be sure your child is tuned in to others’ emotions by teaching and talking about feelings at home. You could also role-play different situations, modeling a good response for your child to copy. 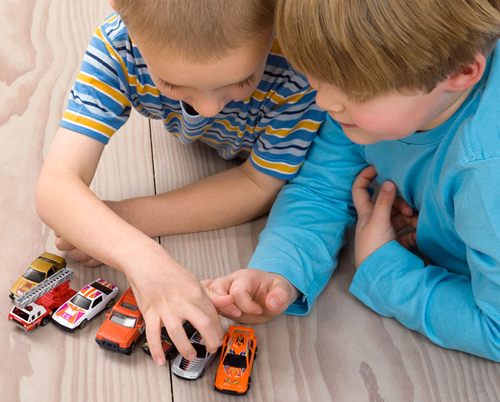 When your child is prepared to let his friend go first some of the time, to share toys, or lose at a game without storming off, he’ll be rewarded with firm friendships. Close supervision, rewards for good sportsmanship, and plenty of practice in taking turns at home build these abilities. If your child has a fight with his friend, help him to resolve it right away to avoid lingering resentment. A quick explanation and apology is often all that’s needed, and playtime can start again. Sociable children tend to have sociable parents, so work on your friendships, too. When you make friends with the parents of your child’s friends you’ll create more chances for them to play together too. Playing or working together on a shared task to achieve a common goal will help strengthen budding friendships. Being able to feel empathy for others and sharing emotions, whether happy or sad, are important aspects of friendship skills. Learning to share and play cooperatively is an important skill for this age, helping your child to make friends.